This entry was posted on June 2, 2017 by MAV Europe. It’s vacation time! 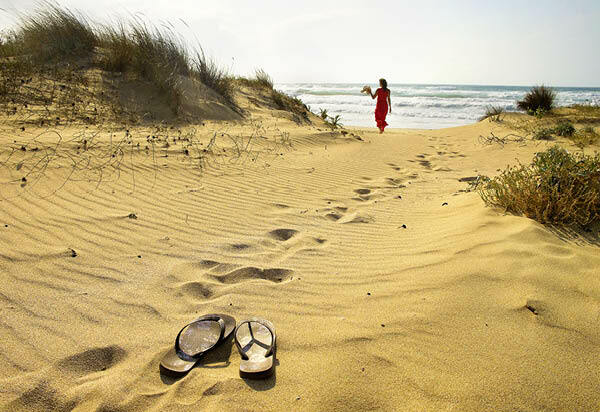 For most people, vacation means resting, relaxing, and taking a break from their often hectic daily life. But vacations can also present a great opportunity to discover something new. We’ve put together a little Ayurvedic travel kit and will show you how Ayurveda can help you slow down and recharge. Are you looking for something to read that will enrich you beyond your vacation? How about “In Balance leben: Wie wir trotz Stress mit unserer Energie richtig umgehen” [Living in balance: How to handle your energy despite stress, in German only]. Based on Ayurveda’s ancient knowledge of healing, the acclaimed author presents you with six steps to help you “manage” your energy more successfully. Would you like to set aside some quiet time during your vacation to learn more about the many possibilities Ayurveda has to offer? “Ayurveda für jeden Tag” (Ayurveda for every day, in German only) by Ayurvedic physician Dr. Ernst Schrott contains many Ayurveda tips on nutrition, body care and health. Perhaps you would like to try new Ayurveda recipes? And if you ever have any aches or pains, Dr. Schrott reveals in the chapter “Beschwerden von Kopf bis Fuß” [Pains from head to toe], how Ayurveda can help with sunburns, headaches and infections. You know that something is good for you, but there just isn’t enough time for it during the day. Does this sound familiar? Often, we don’t find the necessary time for things that are important to us and provide well-being until we’re on vacation. 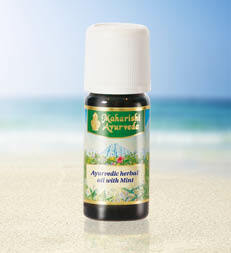 Why not use your next vacation to regularly start your day with the Ayurvedic morning routine? Not only will it kick-start your digestion and metabolism, it will also make you feel fresher and fitter. This way, you can enjoy your vacation even more! The herb mixtures and fine herbal oils made according to ancient original Ayurvedic recipes benefit both your body and mind. Our summer tip: If the sun tends to bleach and dry out your hair, mixed Vata types in particular should use Vata Hair Oil. 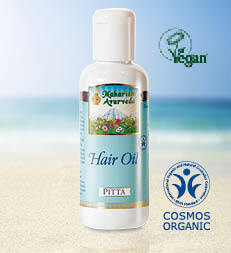 It will provide an extra layer of protection and nurture your damaged summer hair. According to Ayurveda, spices can help make dishes that are difficult to digest more agreeable, particularly unusual dishes served in foreign holiday destinations. Our churnas, which you can use to spice up your dish depending on your taste and the time of year, are especially popular on trips. 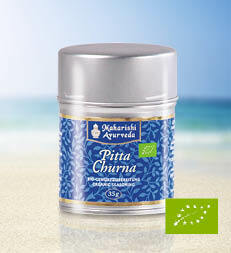 All three churnas are available at Maharishi Ayurveda® in organic quality. You should always have a bottle of Ayurvedic herbal oil with mint on you, just to make sure the unusual cuisine doesn’t spoil your vacation. If you feel unwell after an exotic meal, just add 1 – 2 drops to a glass of hot water and drink it. Digest Plus Tea is used in Ayurveda as a healthy alternative to aperitifs and bitters. Hot and spicy, Digest Plus Tea is a popular travel companion that you ideally drink one hour before or after a heavy dish or big meal. If you’re longing for some peace and quiet, don’t forget to pack some aromatic Vata Tea. A regular cup of this tea can help you balance excess Vata. As tempting as it is, you shouldn’t drink ice-cold drinks on hot days because our body goes into “heating mode” to bring the cold liquid to body temperature. What we initially perceive as refreshing generates extra inner heat in the long run. That is why, according to Ayurveda, you should drink warm to lukewarm water or tea to cool off on hot summer days. We recommend in particular one to two cups of Pitta Tea per day. Try it! Do you love the sun? If so, it’s best to enjoy sunbathing before noon, when the sun’s rays aren’t quite as intense yet. Your skin will thank you! 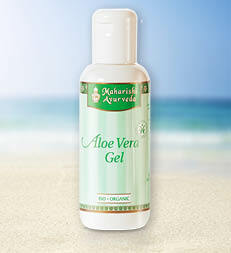 Afterwards indulge yourself and your skin in a nice cooling after-sun care with Maharishi Ayurveda® Aloe Vera Gel. Applied externally, it is a boon to the skin after being out in the sun. It doesn’t matter what type of skin you have, just rub on the Aloe Vera Gel, let it soak in and then apply a body lotion, based on your skin type, or the Ayurvedic After Sun Oil. To help your skin recover from the intense sun, you can also drink one to three glasses of aloe vera juice per day. Aloe vera juice is available in most well-stocked drugstores.